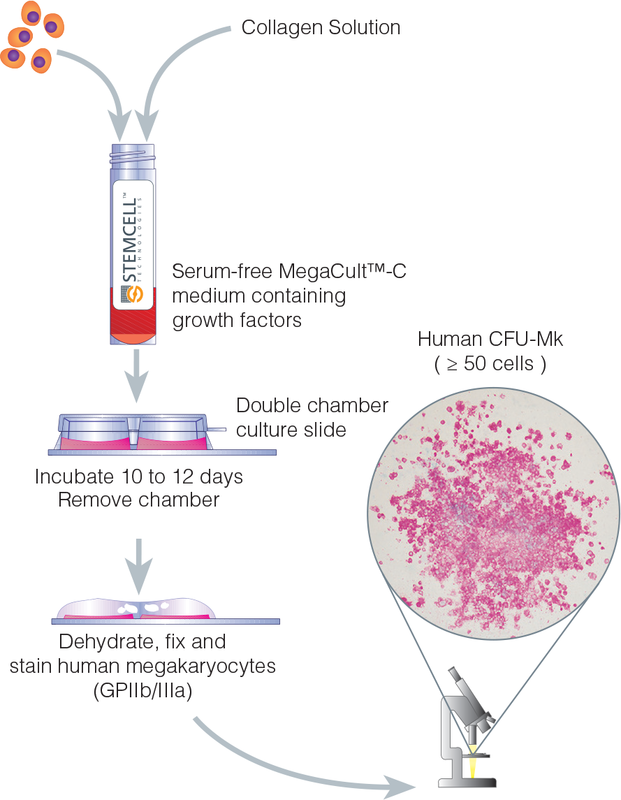 MegaCult™-C is a collagen-based culture system for colony-forming unit (CFU) assays of megakaryocyte progenitors (CFU-Mk) from human or mouse hematopoietic tissues.1 Megakaryocyte colonies are difficult to detect by morphological criteria alone as colonies may contain as few as three cells and megakaryocytes cannot be easily distinguished morphologically from other cell lineages, particularly macrophages. 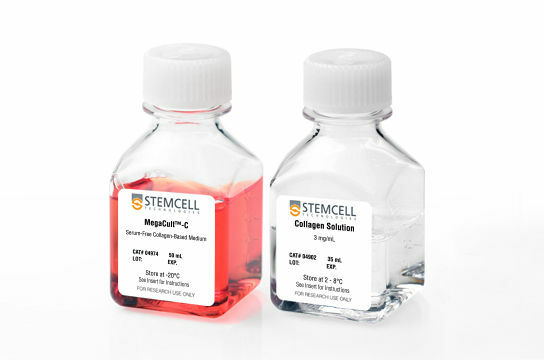 Unlike methylcellulose-based media used in CFU assays for other lineages, collagen gels used in MegaCult™ can be readily dehydrated for subsequent cytochemical or immunocytochemical staining. Human CFU-Mk colony detection in MegaCult™ is based on immunocytochemical staining for the megakaryocyte marker CD41, while mouse colony detection is based on acetylcholinesterase activity. 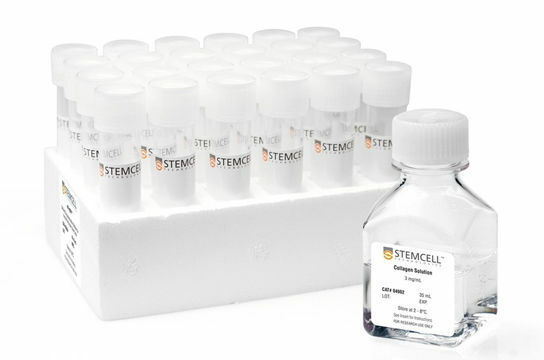 MegaCult™ medium is available in formats with or without cytokines or added lipids. MegaCult™ media with cytokines contain recombinant human (rh) IL-3, IL-6 and TPO for optimal growth of human CFU-Mk. 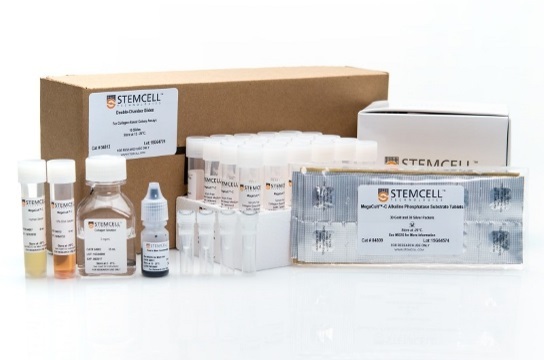 MegaCult™ media without cytokines is recommended for applications where control over the types and amounts of cytokines to use is important, for example for investigation of factors influencing the growth and maturation of megakaryocytic progenitor cells. 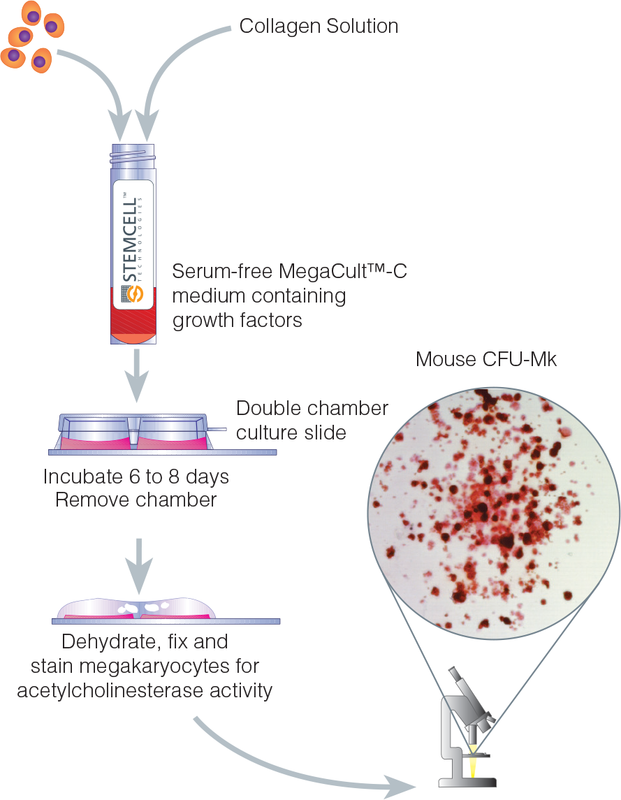 MegaCult™-C media without cytokines is also used for the culture and enumeration of mouse CFU-Mk after addition of appropriate cytokines, such as recombinant mouse IL-3, rhIL-6, rhIL-11, rhTPO and/or other factors, chosen by the user. Culture and enumeration of megakaryocytic progenitors in CFU-Mk assays on human cord blood, bone marrow and peripheral blood. CFU-Mk assays on human cord blood, bone marrow and peripheral blood. CFU-Mk assays on mouse bone marrow. The addition of cytokines is required. CFU-Mk assays on progenitor-enriched preparations of human cord blood, bone marrow and peripheral blood. The addition of cytokines is required. CFU assays for other progenitor cells after addition of appropriate cytokines chosen by the user. Ito C et al. 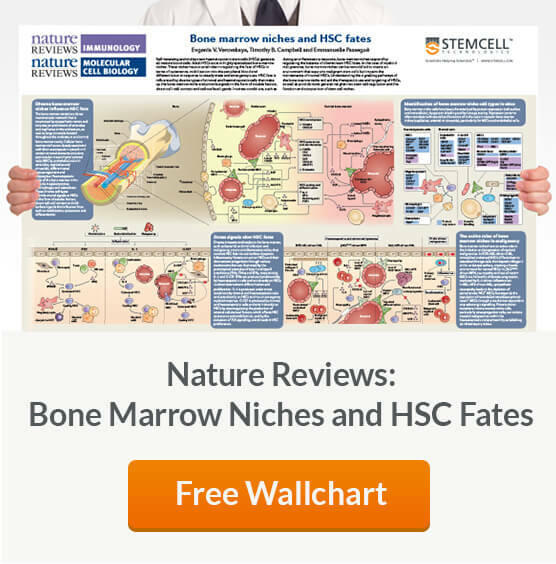 (2003) Hematopoietic stem cell and progenitor defects in Sca-1/Ly-6A-null mice. Hogge D et al. (1997) Quantitation and characterization of human megakaryocyte colony-forming cells using a standardized serum-free agarose assay. Br J Hematol. 96(4): 790-800.